By now everyone is familiar with ETC's awesome First MondayвЂ™s Sales event when dozens of ETC shops participate by listing fabulous sales in their shops. Since 1st MondayвЂ™s are so popular we thought we would give 2nd Mondays their day in the spotlight too! 2nd MondayвЂ™s are Texas Treasure Hunt days! On the 2ND Monday of each month, ETC (Etsy Texas Crafters) will host a Texas size Treasure Hunt! This month we want to warm you up Texas Style! 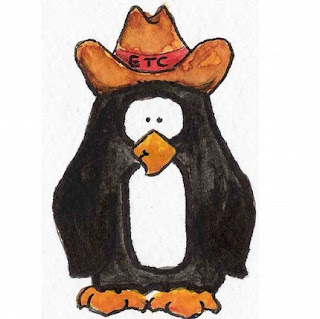 Willy the Perky Penguin has escaped from tiddlyinks shop & is running amuck through Texas Etsy shops picking out all his favorite items to warm you heart, warm your spirits or just plain keep YOU warm. Our Jan Treasure Hunt will begin at 12:01am on Jan 14Th & end at 12:00 midnight on that same day (Central time -- that would be 1:01am Monday to 1:00am Tuesday, Etsy time). To play, search participating ETC member shops to find a minimum of 10 items with the designated image in the items' photos. If there is more than 1 correct entry, by the midnight deadline, all correct entries will be placed in a stocking & one winner will be drawn. If there are no complete & correct entries, the person with the most correct entries will be designated that month's winner. Winner will be notified/announced no later than midnight on Tuesday Dec 11Th. The more items you find and submit, the better your prize selection will be. The winner will get too *choose* 1 item from their submitted list as their prize! In the event that the winnerвЂ™s 1st choice of prizes sells during the contest, winner would have to choose another prize from their submitted list. Have fun hunting!